Recently, Walmart lauded Internet legislation that is currently before the US Senate. They’re selling it as the “Marketplace Fairness Act.” However it’s anything but fair. It’s no wonder Wally World and other large retailers support Internet sales tax! Wally World also supports minimum wage increases. They may paint themselves as benevolent, but their reasons are actually sinister and selfish. They know it will crush small retailers. Small businesses are most impacted by wage costs. We’re seeing it in Obamacare implementation. When the government pushes wage costs higher, small businesses cut back or close altogether. Twitchy is reporting on the “layoff bomb” affecting employees of small business and even some larger corporations. Corporations like Wally World support this legislation because they know it will benefit them. They are more able to absorb the costs of collection. They know the little guy can’t. Once the little guy is squeezed out, they can increase their prices passing that cost on to you and me. Small businesses simply cannot afford anything that adds to our financial burden in such challenging economic times. For some D.C. businesses, increased health insurance costs will mean the difference between staying in business and closing. I know our group struggles each year to provide quality benefits. What is effectively happening here folks is that big business is using the force of government to squash smaller retailers. eBay CEO John Donahoe sees it for what it is. He recently sent out an email to millions of the online marketplace’s users urging them to oppose the bill. 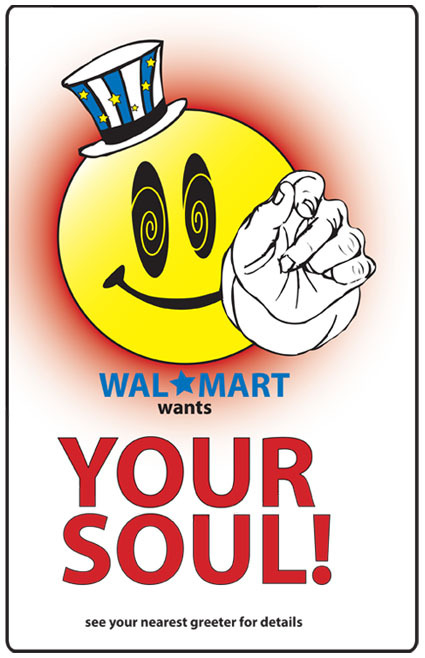 Wally World is the devil intent on crushing that dream. Wally World is anti-American. So is any legislator that supports an Internet sales tax.